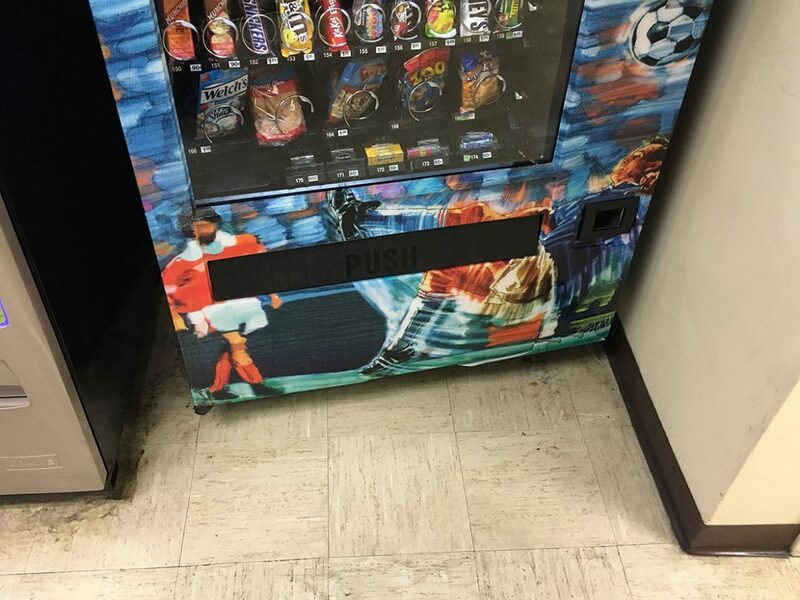 You can accurately judge the frustration level at work by how far off-true the snack machine is. On good days, it is perfectly square with the surrounding walls. If there are problems with its handling and delivery of snacks, staffers are more likely to treat it kindly and walk away or leave gentle, funny notes. On stressful days you can see where it’s been shoved a bit, which can often be explained by a bag of chips dangling maddeningly close to falling, but not quite. Once I saw three bags of Doritos pushed up tight against each other with all three ALMOST ready to fall, which means somewhere in the building there was a person who had paid for three overpriced bags and stalked away fuming and hungry. Sometimes, the machine has been shoved quite hard. Those are the days you walk softly, and talk as little as possible. This morning when I pulled into work, it was in a tree outside. It was about 15 feet up, wedged between a large bough and the main trunk of the oak. There were leaves and broken glass and Tom’s Peanut Butter Crackers and M&Ms in a wide radius everywhere. Judging from the deep gouges in the tree, the machine had been hurled there with great force. I’m still sitting in my car. Today might be a good day to call in.